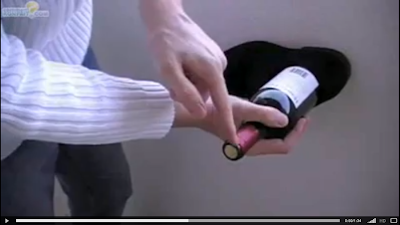 Devoid Of Culture And Indifferent To The Arts: How To: Open a Wine Bottle without a Corkscrew! I don’t know if this is foolproof or not, but I’m willing to give it a try. I usually write about food. I write about gardening. I build the odd thing and post about it. Occasionally I even rant about something that gets up my nose. But sometimes something so amazingly useful comes along that I just have to bring it to your attention. This is one. I suppose it is laterally related to food. What’s a good meal without a glass of wine? Have you ever had a bottle of wine sitting on the counter and no opener? I would imagine it’s the same feeling a dog has looking at the jar of treats on the shelf. Frustrating. It can happen to the best of us. We’re at a picnic, or we go visit someone with a lovely wine gift under our arm. Or perhaps you've taken your friends up on their offer of their cabin for the weekend, only to discover there's narry a corkscrew to be found. Horrors. Soon you will know how to open wine anywhere you finds yourself in the world without a corkscrew as long as you’re fully clothed. Watch this guy open up a bottle of wine – with only his shoe. It’s in French, and although Canada’s an officially bilingual country, I haven’t a clue what he’s saying. Veuillez pardonner mon ignorance. Thank goodness that the short video is completely self-explanatory. This only takes a little more than a minute to watch, but this is information you’ll carry with you for life. Be prepared to be truly amazed. I’m assuming that other items can also be used, as long as they have the proper cushioning effect.